To borrow an old real estate aphorism, there are three things that matter about property: location, location, and location. 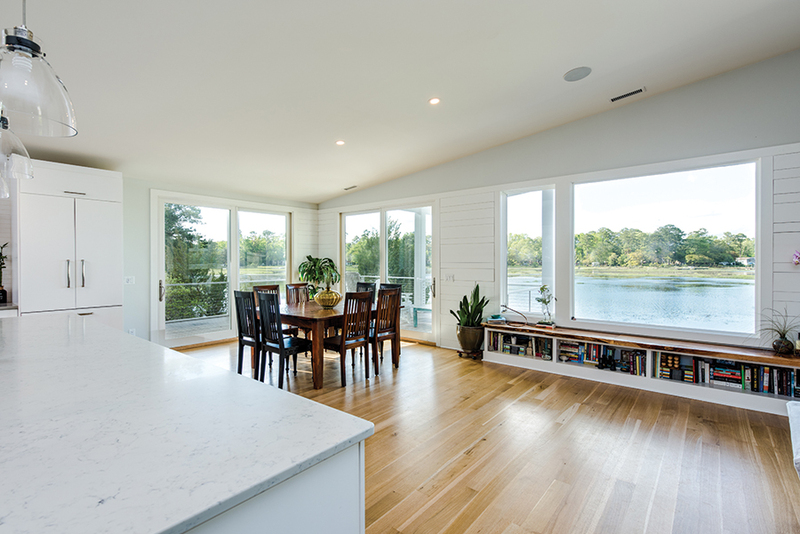 In the case of Josh and Jen Mihaly, it was a spectacular marshland lot with panoramic views of Pages Creek that demanded their attention. “My son actually found the lot listed on Craigslist. 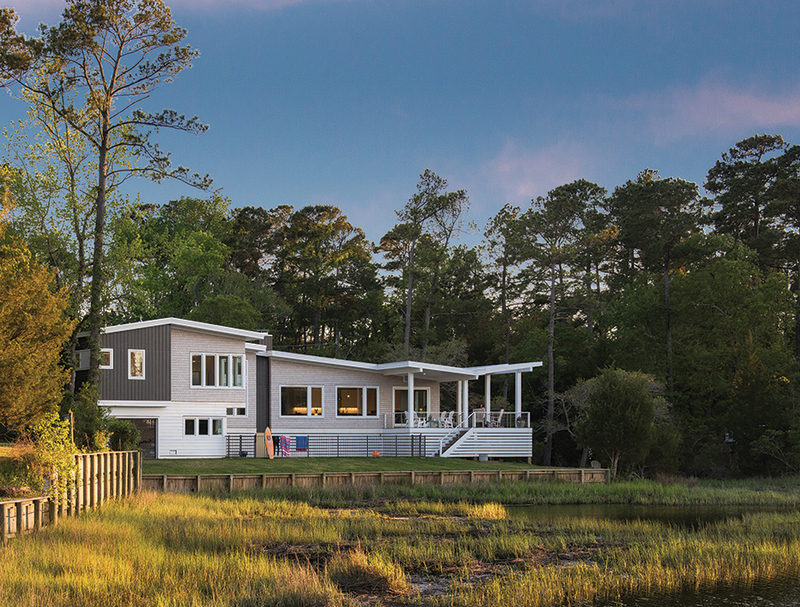 We were living on the other side of Middle Sound Loop Road and I was looking to build,” says Josh, a landscape architect with a successful practice in Wilmington. Although his wife, Jen, was perfectly happy at their old place, when she learned more about the land she was ready to move: “When I heard that we were on a dead end, on the sound, no HOA, still Middle Sound Loop Road, how could I possible say no?” But the lot had lingered on the market. “People wondered how they could build on what appeared to be the edge of a marsh overlooking Pages Creek,” says Josh. But being a landscape architect, he could envision the challenge. Sold. The Mihalys soon met with Kersting at his office and brought pictures of the kind of houses and looks that they liked. Josh was very particular about the details. They wanted something contemporary, but not cold, remote modernism — something that felt warm. “I tried to create a house for them that’s a celebration of the landscape and exploits the views,” says Kersting. 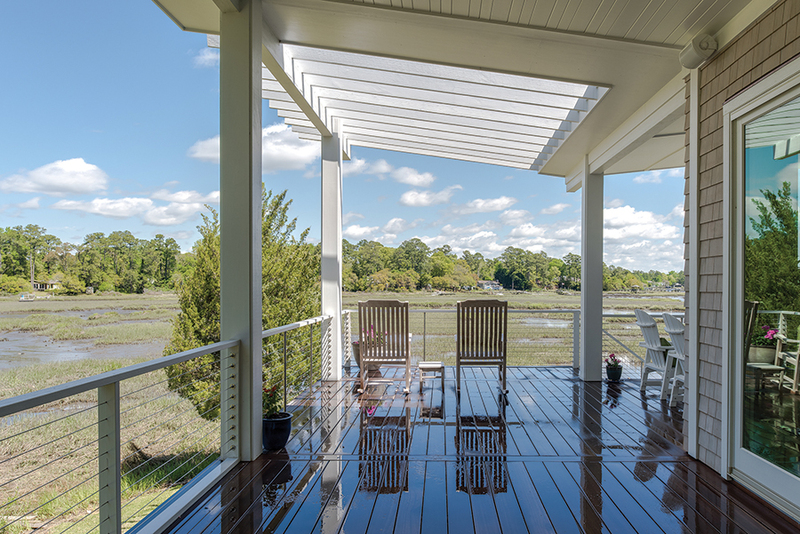 The resulting house, which Kersting created with design assistance from former associate architect Jaime Smith, was lovingly christened Mud Hinge, a name that makes complete sense if you are paying a visit at low tide, when about a foot of marsh grass and the river bottom are in view. Building on such a site is not without its challenges. One of the first things Josh did was shore things up (no pun intended) —he installed a bulkhead at the edge of the marsh and planted a green lawn with an elegant lap pool behind it. And some elevation needed to occur. “We had to get out of the flood plain — the house is in a FEMA flood zone — but I certainly wanted to avoid those houses that looked like elephants on stilts,” says Kersting. 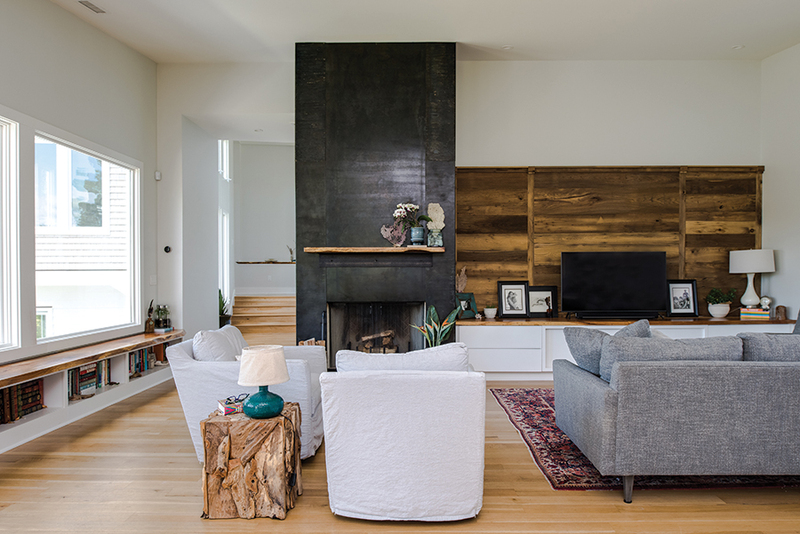 “And we wanted to keep to a strict budget, so we wanted a lot a bang for the buck.” Josh himself put a lot of sweat-equity in the house with the help of his old friend Parker Dudley, a local builder who helped him source materials and served as a stealth general contractor. The resulting design is a simple hinged form with a shed roof that is raised just enough to take advantage of the panoramic views. “It’s actually a split-level, perfect in the context of the surrounding neighborhood,” Kersting continues. “It’s a coastal ranch house in a lot of ways, starting with the midcentury retro vibe of the roofline.” The coastal vernacular extends to the cedar shingles on the outside of the house and the nautical use of steel cording as deck railing. One enters the house mid-hinge in the entry hall, a short few steps above the street level. (You can also feel a noticeable change of angle as you ascend the stairs.) This acts as a divide between the bedroom wing to the right and a large combined living and dining room to the left. 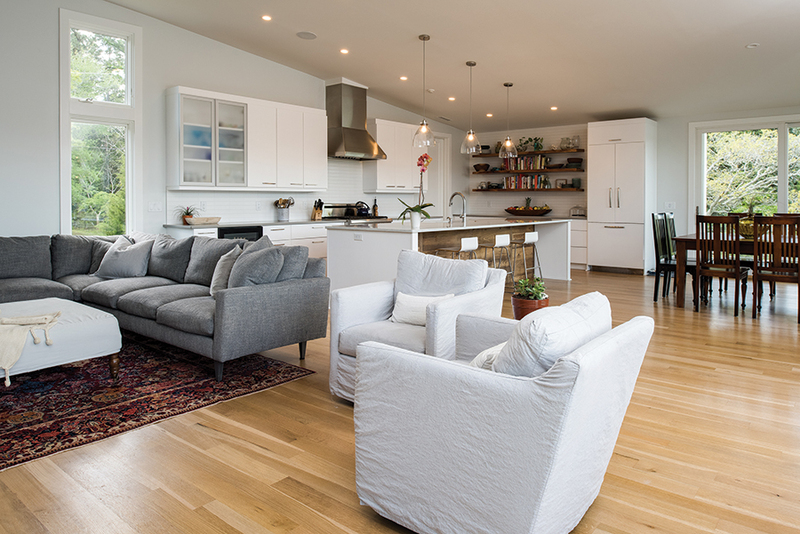 Despite the large scale of the room — and a sloped ceiling that ranges from 9 to 12 feet high — natural details add warmth. 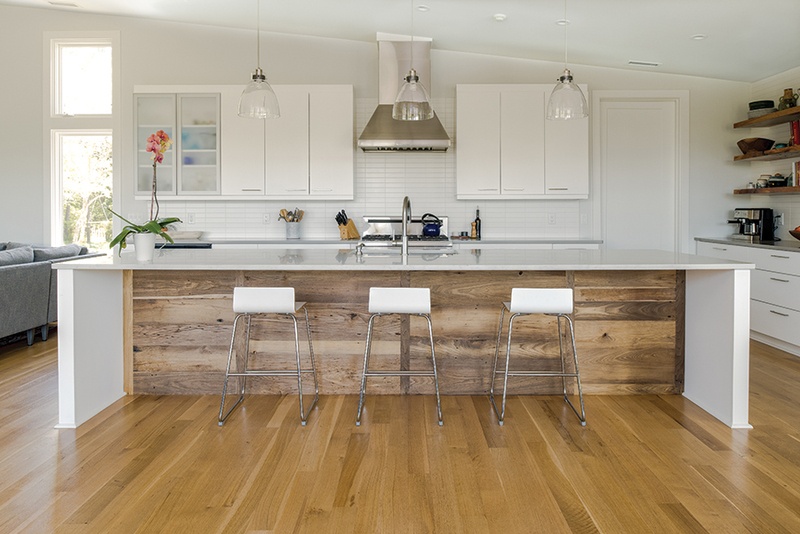 Burnished old chestnut beams salvaged from Josh’s uncle’s 19th-century barn in western Pennsylvania line one wall. “My son and I drove up and got it and drove it back down here. It’s a beautiful old wood,” says Josh. The bedroom wing has a sensible parting of ways between the master suite (east-facing) and kids’ rooms (west-facing), each accessible by short staircases. The children’s wing has a public area with a sofa, and above, a loft for hanging out, particularly popular with visiting nieces and nephews. The space below hides mechanical equipment. “We opened up the space by not extending it to the ceiling, so light comes through. 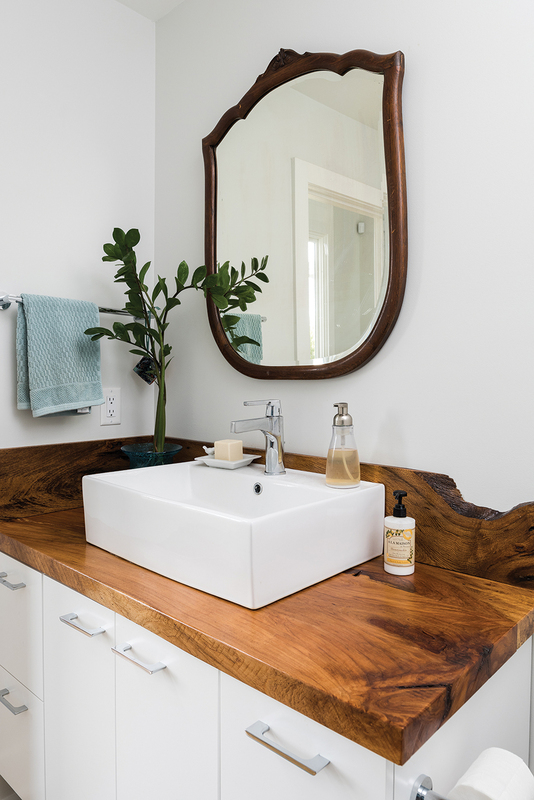 It creates a light and airy space,” says Kersting. But a tour of Mud Hinge would not be complete without a visit to what is known as the Sworkroom — a combined surfboard storage (13 boards and counting) and woodworking space. Josh has surfed for more than 30 years, since he was a young man in Delaware, and his two sons are following that tradition. They have gone on family surfing adventures in Central America and the Caribbean. Complete with a white canvas-covered sofa, it is a great hangout zone; thanks to a sliding garage door with glass panels that opens to the pool area, it also serves as a cabana for the swimming pool people. Mud Hinge is a house that celebrates the outdoors, and you can tell that living here must feel like being on vacation all the time. The owners do not disagree. William Irvine is the senior editor of Salt.